For first layer, pour 1 cup boiling water on 1 package gelatin in bowl; stir until gelatin is dissolved. Stir in 3/4 cup cold water. Pour 1/2 cup of the gelatin mixture into 5-cup mold: refrigerate. Reserve remaining gelatin mixture for third layer. For second layer, pour 1 cup boiling water on second package gelatin in bowl; stir until gelatin is dissolved. 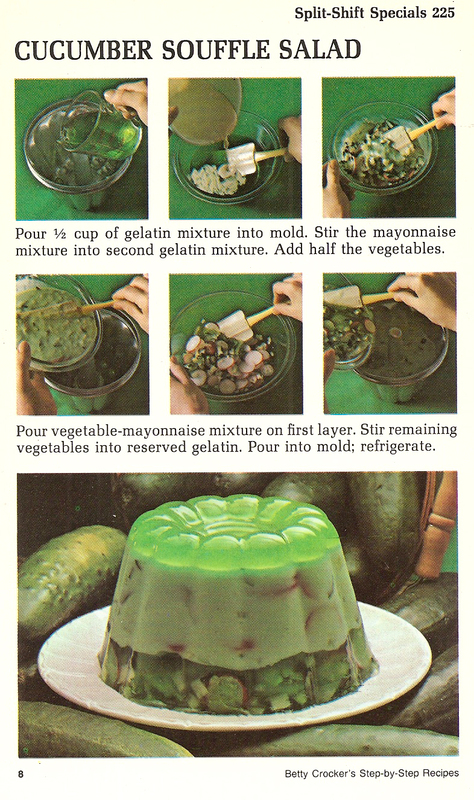 Mix mayonnaise, 1/4 cup cold water, the vinegar and salt; stir into gelatin mixture. Refrigerate until slightly thickened, about 1 hour. Stir in half of the cucumber, celery and radishes. Pour on the first layer in mold; refrigerate. For third layer, refrigerate reserved gelatin until slightly thickened, about 1 hour. Stir in remaining vegetables; pour on second layer in mold. Refrigerate until firm, at least 5 hours. 8 servings. Timing Tip: If you want to serve at different times, Cucumber Soufflé Salad will hold in the refrigerator up to 24 hours.